You may recall our ‘on the wrist’ post last year about the Ulysse Nardin Executive Dual Time. Well earlier this year, we had the chance to look a variant of this – the Executive Skeleton Tourbillon in blue ceramic and titanium. The design is a variation on the same theme, but the tourbillon is in a larger 45mm case, and this this time it is not stainless steel and ceramic, but titanium and ceramic, making it extremely light on the wrist. At the heart of the watch, and displayed through the skeletonised dial, is the manual-wind Calibre UN-171 with a flying tourbillon and an impressive 170 hour power reserve. As you can see particularly in the above photo, the stark modern lines of the skeletonisation are perhaps at its most noticeable from the rear. 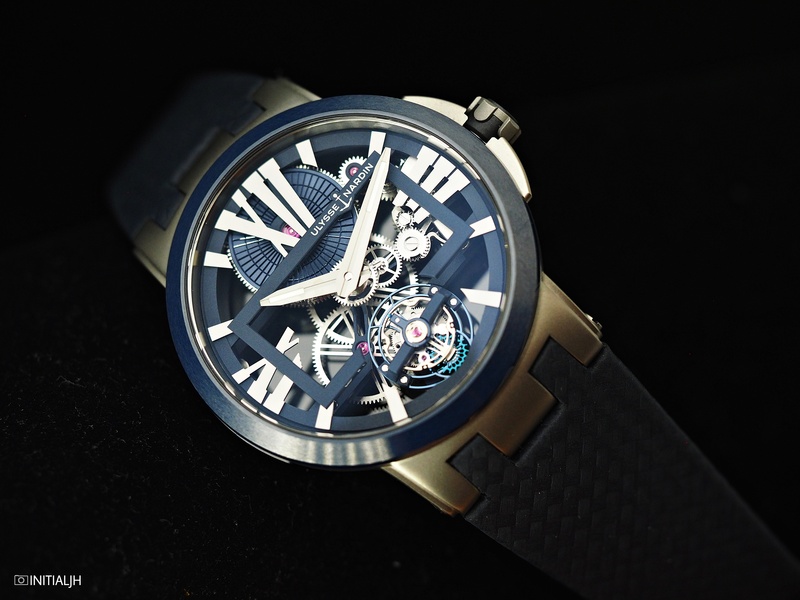 This Executive Skeleton Tourbillon comes in a black as well as blue version. Both come on a leather strap with a ‘carbon’ look on a folding buckle.